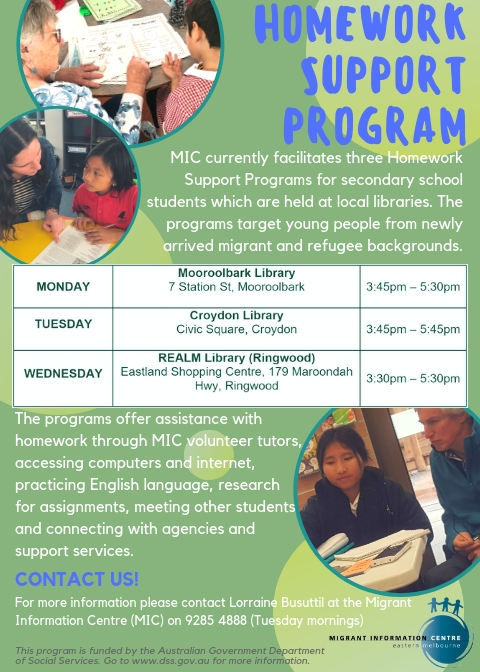 MIC currently facilitates three Homework Support Programs for secondary aged school students which are held at local libraries. The programs target young people from newly arrived migrant and refugee backgrounds and offers assistance with homework through MIC volunteer tutors, accessing computers and internet, practicing English language, research for assignments, meeting other students and connecting with agencies and support services. Where is REALM Library – Eastland Shopping Centre?